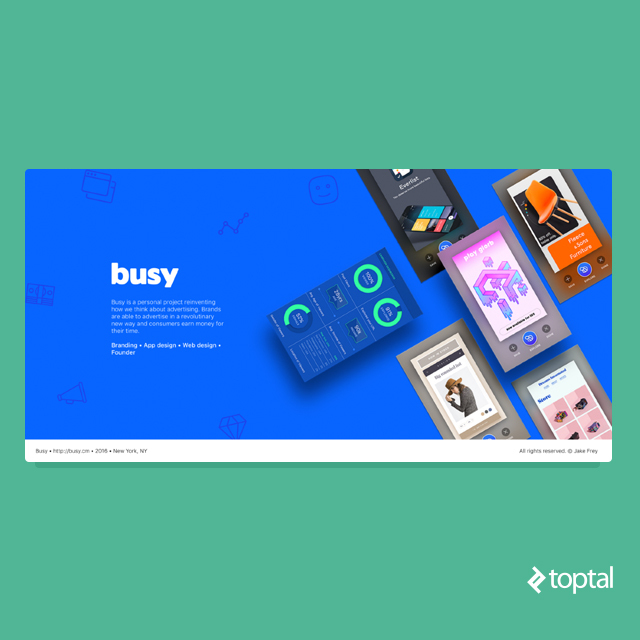 At Toptal we screen a lot of designers, so over time we have learned what goes into making a captivating and coherent portfolio. Each designer’s portfolio is like an introduction to an individual designer’s skill set and strengths and represents them to future employers, clients and other designers. It shows both past work, but also future direction. There are several things to keep in mind when building a portfolio, so here is the Toptal Guide of tips and common mistakes for portfolio design. The main use of the portfolio is to present your design work. Thus, the content should inform the layout and composition of the document. Consider what kind of work you have, and how it might be best presented. A UX designer may require a series of animations to describe a set of actions, whereas the visual designer may prefer spreads of full images. 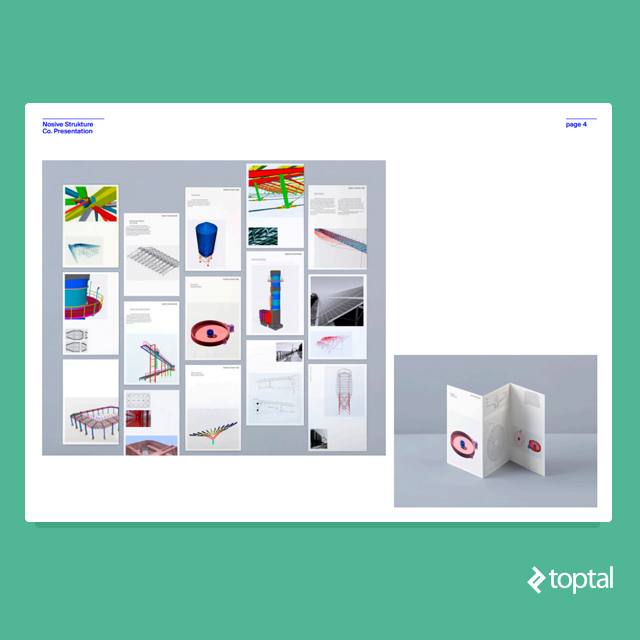 The portfolio design itself is an opportunity to display your experiences and skills. However, excessive graphic flourishes shouldn’t impede the legibility of the content. Instead, consider how the backgrounds of your portfolio can augment or enhance your work. The use of similar colors as the content in the background will enhance the details of your project. Lighter content will stand out against dark backgrounds. Legibility is critical, so ensure that your portfolio can be experienced in any medium, and considers all accessibility issues such as color palettes and readability. You should approach your portfolio in the same manner you would any project. What is the goal here? Present it in a way that makes sense to viewers who are not essentially visually savvy. Edit out projects that may be unnecessary. Your portfolio should essentially be a taster of what you can do, a preparation for the client of what to expect to see more of in the interview. The more efficiently that you can communicate who you are as a designer, the better. A portfolio for a client should likely be different than a portfolio shown to a blog editor, or an art director. Your professional portfolio should always cater to your target audience. Edit it accordingly. If your client needs branding, then focus on your branding work. If your client needs UX Strategy than make sure to showcase your process. Even from client to client, or project to project your portfolio will need tweaking. If you often float between several design disciplines, as many designers do, it would be useful to curate a print designer portfolio separately from a UX or visual design portfolio. As the design industry has evolved, so have our clients, and their appreciation for our expertise and what they hire us to do. Our process is often as interesting and important to share with them, as the final deliverables. Try to tell the story of your product backwards, from final end point through to the early stages of the design process. Share your sketches, your wireframes, your user journeys, user personas, and so on. Showing your process allows the reader to understand how you think and work through problems. Consider this an additional opportunity to show that you have an efficient and scalable process.. Attention to detail, both in textual and design content are important aspects of any visual presentation, so keep an eye on alignment, image compression, embedded fonts and other elements, as you would any project. The careful treatment of your portfolio should reflect how you will handle your client’s work. With any presentation, your choice of typeface will impact the impression you give, so do research the meaning behind a font family, and when in doubt, ask your typography savvy friends for advice. Any designer should be able to discuss their projects as avidly as they can design them. Therefore your copywriting is essential. True, your work is the main draw of the portfolio – however the text, and how you write about your work can give viewers insight into your portfolio. Not everyone who sees your work comes from a creative, or visual industry. Thus, the descriptive text that you provide for images is essential. At the earlier stages of a project, where UX is the main focus, often you will need to complement your process with clearly defined content, both visual diagrams, and textual explanation. Text can also be important for providing the context of the project. Often much of your work is done in the background, so why not present it somehow? What was the brief, how did the project come about? The culture of the portfolio networks like Behance or Dribble have cultivated many bad habits and trends in portfolio design. A popular trend is the perspective view of a product on a device. However, these images often do little to effectively represent the project, and hide details and content. Clients need to see what you have worked on before, with the most logical visualisation possible. 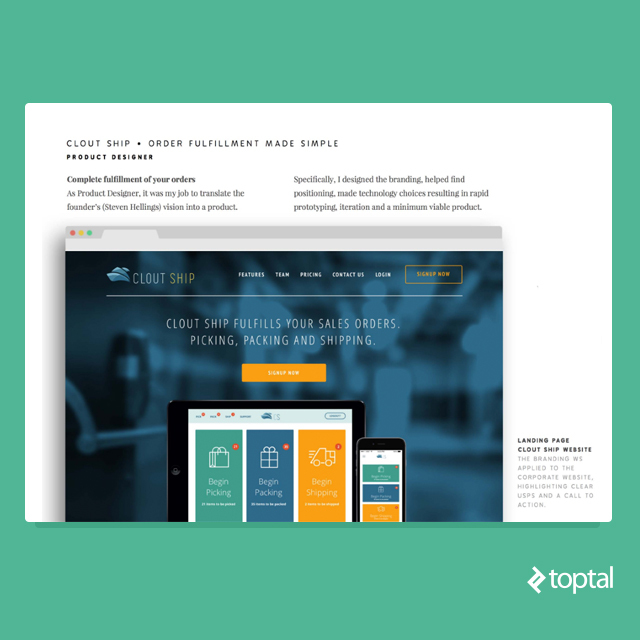 Showcasing your products in a frontal view, with an “above the fold” approach often makes more sense to the non-visual user. Usually, the best web pages and other digital content are presented with no scrolling required. Avoid sending your website portfolio as one long strip, as this is only appropriate for communicating with developers. Ensure that you cover the bases on all portfolio formats. Today it is expected for you to have an online presence, however some clients prefer that you send a classic A4 or US letterhead sized PDF. You need to have the content ready for any type of presentation. Try to use a consistent presentation style and content throughout the projects in your portfolio. Differentiate each project with simple solutions like different coloured backgrounds, or textures, yet within the same language.